Chester Alan Arthur (October 5, 1829  November 18, 1886) was an American attorney and politician who served as the 21st President of the United States (1881-85); he succeeded James A. Garfield upon the latter’s assassination. At the outset, Arthur struggled to overcome a slightly negative reputation, which stemmed from his early career in politics as part of New York’s Republican political machine. He succeeded by embracing the cause of civil service reform. His advocacy for, and subsequent enforcement of, the Pendleton Civil Service Reform Act was the centerpiece of his administration. Arthur was born in Fairfield, Vermont, grew up in upstate New York, and practiced law in New York City. He served as quartermaster general in the New York Militia during the American Civil War. Following the war, he devoted more time to Republican politics and quickly rose in the political machine run by New York Senator Roscoe Conkling. Appointed by President Ulysses S. Grant to the lucrative and politically powerful post of Collector of the Port of New York in 1871, Arthur was an important supporter of Conkling and the Stalwart faction of the Republican Party. In 1878, the new president, Rutherford B. Hayes, fired Arthur as part of a plan to reform the federal patronage system in New York. 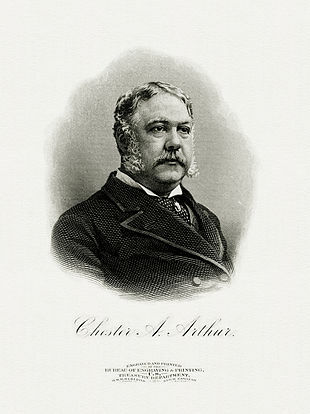 When Garfield won the Republican nomination for president in 1880, Arthur, an eastern Stalwart, was nominated for vice president to balance the ticket. After just half a year as vice president, Arthur found himself in the executive mansion due to the assassination of his predecessor. To the surprise of reformers, Arthur took up the cause of reform, though it had once led to his expulsion from office. He signed the Pendleton Act into law and strongly enforced its provisions. He gained praise for his veto of a Rivers and Harbors Act that would have appropriated federal funds in a manner he thought excessive. He presided over the rebirth of the United States Navy, but was criticized for failing to alleviate the federal budget surplus, which had been accumulating since the end of the Civil War. Suffering from poor health, Arthur made only a limited effort to secure the Republican Party’s nomination in 1884; he retired at the close of his term. Journalist Alexander McClure later wrote, “No man ever entered the Presidency so profoundly and widely distrusted as Chester Alan Arthur, and no one ever retired … more generally respected, alike by political friend and foe.” Although his failing health and political temperament combined to make his administration less active than a modern presidency, he earned praise among contemporaries for his solid performance in office. The New York World summed up Arthur’s presidency at his death in 1886: “No duty was neglected in his administration, and no adventurous project alarmed the nation.”Mark Twain wrote of him, “t would be hard indeed to better President Arthur’s administration.” Over the 20th and 21st centuries, however, Arthur’s reputation mostly faded among the public. Chester Alan Arthur was born October 5, 1829, in Fairfield, Vermont. Arthur’s mother, Malvina Stone, was born in Vermont, the daughter of George Washington Stone and Judith Stevens. Malvina’s family was primarily of English and Welsh descent, and her grandfather, Uriah Stone, fought in the Continental Army during the American Revolution. His father, William Arthur, was born in Dreen, Cullybackey, County Antrim, Ireland to a Presbyterian family of primarily Scottish and English descent; he graduated from college in Belfast and emigrated to Canada in 1819 or 1820. Arthur’s mother met his father while William Arthur was teaching at a school in Dunham, Quebec, just over the border from her native Vermont. The two married in Dunham on April 12, 1821, soon after meeting. After their first child, Regina, was born, the Arthurs moved to Vermont. They quickly moved from Burlington to Jericho, and finally to Waterville, as William received positions teaching at different schools. William Arthur also spent a brief time studying law, but while still in Waterville, he departed from both his legal studies and his Presbyterian upbringing to join the Free Will Baptists; he spent the rest of his life as a minister in that sect. William Arthur became an outspoken abolitionist, which often made him unpopular with some members of his congregations and contributed to the family’s frequent moves. In 1828, the family moved again, to Fairfield, where Chester Alan Arthur was born the following year; he was the fifth of nine children. He was named “Chester” after Chester Abell, the physician and family friend who assisted in his birth, and “Alan” for his paternal grandfather. The family remained in Fairfield until 1832, when William Arthur’s profession took them on the road again, to churches in several towns in Vermont and upstate New York. The family finally settled in the Schenectady, New York area. Ann (1828-1915), a career educator who taught school in New York, as well as working in South Carolina in the years immediately before and after the Civil War. William (1834-1915), a medical school graduate who became a career Army officer and paymaster, he was wounded during his Civil War service. William Arthur retired in 1898 with the brevet rank of lieutenant colonel, and permanent rank of major. The family’s frequent moves later spawned accusations that Chester Arthur was not a native-born citizen of the United States. When Arthur was nominated for vice president in 1880, a New York attorney and political opponent, Arthur P. Hinman, initially speculated that Arthur was born in Ireland and did not come to the United States until he was fourteen years old. Had that been true, opponents might have argued that Arthur was constitutionally ineligible for the vice presidency under the United States Constitution‘s natural-born-citizen clause. When Hinman’s original story did not take root, he spread a new rumor that Arthur was born in Canada. This claim, too, failed to gain credence. Arthur spent some of his childhood years living in the New York towns of York, Perry, Greenwich, Lansingburgh, Schenectady, and Hoosick. One of his first teachers said Arthur was a boy “frank and open in manners and genial in disposition.” During his time at school, he gained his first political inclinations and supported the Whig Party. He joined other young Whigs in support of Henry Clay, even participating in a brawl against students who supported James K. Polk. Arthur also supported the Fenian Brotherhood, an Irish republican organization founded in America; he showed this support by wearing a green coat. Arthur enrolled at Union College, in Schenectady, New York, in 1845, where he studied the traditional classical curriculum. As a senior, he was president of the debate society and was elected to Phi Beta Kappa. During his winter breaks, Arthur served as a teacher at a school in Schaghticoke. After graduating, Arthur returned to Schaghticoke and became a full-time teacher, and soon began to pursue an education in law. While studying law, he continued teaching, moving closer to home by taking a job at a school in North Pownal, Vermont. Coincidentally, future president James A. Garfield taught penmanship at the same school three years later, but the two did not cross paths during their teaching careers. In 1852, Arthur moved again, to Cohoes, New York, to become the principal of a school at which his sister, Malvina, was a teacher. In 1853, after studying at State and National Law School in Ballston Spa, New York, and then saving enough money to relocate, Arthur moved to New York City to read law at the law office of Erastus D. Culver, an abolitionist lawyer and family friend. When Arthur was admitted to the New York bar in 1854, he joined Culver’s firm, which was subsequently renamed Culver, Parker, and Arthur. 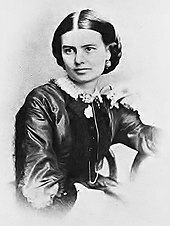 In 1856, Arthur courted Ellen Herndon, the daughter of William Lewis Herndon, a Virginia naval officer. The two were soon engaged to be married. Later that year, he started a new law partnership with a friend, Henry D. Gardiner, and traveled with him to Kansas to consider purchasing land and setting up a law practice there. At that time, the state was the scene of a brutal struggle between pro-slavery and anti-slavery forces, and Arthur lined up firmly with the latter. The rough frontier life did not agree with the genteel New Yorkers; after three or four months the two young lawyers returned to New York City, where Arthur comforted his fiancée after her father was lost at sea in the wreck of the SS Central America. In 1859, they were married at Calvary Episcopal Church in Manhattan. After his marriage, Arthur devoted his efforts to building his law practice, but also found time to engage in Republican party politics. In addition, he indulged his military interest by becoming Judge Advocate General for the Second Brigade of the New York Militia. In 1861, Arthur was appointed to the military staff of Governor Edwin D. Morgan as engineer-in-chief. The office was a patronage appointment of minor importance until the outbreak of the Civil War in April 1861, when New York and the other northern states were faced with raising and equipping armies of a size never before seen in American history. Arthur was commissioned as a brigadier general and assigned to the state militia’s quartermaster department. He was so efficient at housing and outfitting the troops that poured into New York City that he was promoted to inspector general of the state militia in April 1862, and then to quartermaster general that July. He had an opportunity to serve at the front when the 9th New York Volunteer Infantry Regiment elected him colonel early in the war, but at Governor Morgan’s request, he turned it down to remain at his post in New York. He also turned down command of four New York City regiments organized as the Metropolitan Brigade, again at Morgan’s request. The closest Arthur came to the front was when he traveled south to inspect New York troops near Fredericksburg, Virginia, in May 1862, shortly after forces under Major General Irvin McDowell seized the town during the Peninsula Campaign. That summer, he and other representatives of northern governors met with Secretary of State William H. Seward in New York to coordinate the raising of additional troops, and spent the next few months enlisting New York’s quota of 120,000 men. Arthur received plaudits for his work, but his post was a political appointment, and he was relieved of his militia duties in January 1863 when Governor Horatio Seymour, a Democrat, took office. When Reuben Fenton won the 1864 election for governor, Arthur requested reappointment; Fenton and Arthur were from different factions of the Republican Party, and Fenton had already committed to appointing another candidate, so Arthur did not return to military service. 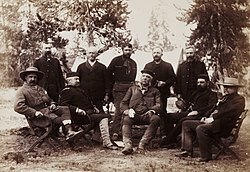 On April 5, 1882, Arthur was elected to the District of Columbia Commandery of the Military Order of the Loyal Legion of the United States (MOLLUS) as a Third Class Companion, the honorary membership category for militia officers and civilians who made significant contributions to the war effort. He was assigned MOLLUS insignia number 2430. In addition, Grand Army of the Republic posts in Ogdensburg, Wisconsin and Medford, Oregon were named in his honor. Arthur returned to being a lawyer, and with the help of additional contacts made in the military, he and the firm of Arthur & Gardiner flourished. Even as his professional life improved, however, Arthur and his wife experienced a personal tragedy as their only child, William, died suddenly that year at the age of three. The couple took their son’s death hard, and when they had another son, Chester Alan Jr., in 1864, they lavished attention on him. They also had a daughter, Ellen, in 1871. Both children survived to adulthood. Arthur’s political prospects improved along with his law practice when his patron, ex-Governor Morgan, was elected to the United States Senate. He was hired by Thomas Murphy, a Republican politician, but also a friend of William M. Tweed, the boss of the Tammany Hall Democratic organization. Murphy was also a hatter who sold goods to the Union Army, and Arthur represented him in Washington. The two became associates within New York Republican party circles, eventually rising in the ranks of the conservative branch of the party dominated by Thurlow Weed. In the presidential election of 1864, Arthur and Murphy raised funds from Republicans in New York, and they attended Abraham Lincoln‘s inauguration in 1865. The New York Custom House (formerly the Merchants’ Exchange building at 55 Wall Street) was Arthur’s office for seven years. The end of the Civil War meant new opportunities for the men in Morgan’s Republican machine, including Arthur. Morgan leaned toward the conservative wing of the New York Republican party, as did the men who worked with him in the organization, including Weed, Seward (who continued in office under President Andrew Johnson), and Roscoe Conkling (an eloquent Utica Congressman and rising star in the party). Arthur rarely articulated his own political ideas during his time as a part of the machine; as was common at the time, loyalty and hard work on the machine’s behalf was more important than actual political positions. At the time, U.S. Custom Houses were managed by political appointees who served as Collector, Naval Officer and Surveyor. In 1866, Arthur unsuccessfully attempted to secure the position of Naval Officer at the New York Custom House, a lucrative job subordinate only to the Collector. He continued his law practice (now a solo practice after Gardiner’s death) and his role in politics, becoming a member of the prestigious Century Club in 1867. Conkling, elected in 1867 to the United States Senate, noticed Arthur and facilitated his rise in the party, and Arthur became chairman of the New York City Republican executive committee in 1868. His ascent in the party hierarchy kept him busy most nights, and his wife resented his continual absence from the family home on party business. Conkling succeeded to leadership of the conservative wing of New York’s Republicans by 1868 as Morgan concentrated more time and effort on national politics, including serving as chairman of the Republican National Committee. The Conkling machine was solidly behind General Ulysses S. Grant‘s candidacy for president, and Arthur raised funds for Grant’s election in 1868. The opposing Democratic machine in New York City, known as Tammany Hall, worked for Grant’s opponent, former New York Governor Horatio Seymour; while Grant was victorious in the national vote, Seymour narrowly carried the state of New York. Arthur began to devote more of his time to politics and less to law, and in 1869 he became counsel to the New York City tax commission, appointed when Republicans controlled the state legislature. He remained at the job until 1870 at a salary of $10,000 a year. Arthur resigned after Democrats controlled by William M. Tweed of Tammany Hall won a legislative majority, which meant they could name their own appointee. In 1871 Grant offered to name Arthur as Commissioner of Internal Revenue, replacing Alfred Pleasonton; Arthur declined the appointment. The Senate confirmed Arthur’s appointment; as Collector he controlled nearly a thousand jobs and received compensation as great as any federal officeholder. Arthur’s salary was initially $6,500, but senior customs employees were compensated additionally by the “moiety” system, which awarded them a percentage of the cargoes seized and fines levied on importers who attempted to evade the tariff. In total, his income came to more than $50,000more than the president’s salary, and more than enough for him to enjoy fashionable clothes and a lavish lifestyle. Among those who dealt with the Custom House, Arthur was one of the era’s more popular collectors. He got along with his subordinates and, since Murphy had already filled the staff with Conkling’s adherents, he had few occasions to fire anyone. He was also popular within the Republican party as he efficiently collected campaign assessments from the staff and placed party leaders’ friends in jobs as positions became available. Arthur had a better reputation than Murphy, but reformers still criticized the patronage structure and the moiety system as corrupt. A rising tide of reform within the party caused Arthur to rename the financial extractions from employees as “voluntary contributions” in 1872, but the concept remained, and the party reaped the benefit of controlling government jobs. In that year, reform-minded Republicans formed the Liberal Republican party and voted against Grant, but he was re-elected in spite of their opposition. Nevertheless, the movement for civil service reform continued to chip away at Conkling’s patronage machine; in 1874 Custom House employees were found to have improperly assessed fines against an importing company as a way to increase their own incomes, and Congress reacted, repealing the moiety system and putting the staff, including Arthur, on regular salaries. As a result, his income dropped to $12,000 a yearmore than his nominal boss, the Secretary of the Treasury, but far less than what he had previously received. Arthur’s four-year term as Collector expired on December 10, 1875, and Conkling, then among the most powerful politicians in Washington, arranged his protégé’s reappointment by President Grant. By 1876, Conkling was considering a run for the presidency himself, but the selection of reformer Rutherford B. Hayes by the 1876 Republican National Convention preempted the machine boss. Arthur and the machine gathered campaign funds with their usual zeal, but Conkling limited his own campaign activities to a few speeches. Hayes’s opponent, New York Governor Samuel J. Tilden, carried New York and won the popular vote nationwide, but after the resolution of several months of disputes over twenty electoral votes (from the states of Florida, Louisiana, Oregon, and South Carolina), he lost the presidency. Hayes entered office with a pledge to reform the patronage system; in 1877, he and Treasury Secretary John Sherman made Conkling’s machine the primary target. Sherman ordered a commission led by John Jay to investigate the New York Custom House. Jay, with whom Arthur had collaborated in the Lemmon case two decades earlier, suggested that the Custom House was overstaffed with political appointments, and that 20% of the employees were expendable. Sherman was less enthusiastic about the reforms than Hayes and Jay, but he approved the commission’s report and ordered Arthur to make the personnel reductions. Arthur appointed a committee of Custom House workers to determine where the cuts were to be made and, after a written protest, carried them out. Notwithstanding his cooperation, the Jay Commission issued a second report critical of Arthur and other Custom House employees, and subsequent reports urging a complete reorganization. Hayes further struck at the heart of the spoils system by issuing an executive order that forbade assessments, and barred federal office holders from “…tak part in the management of political organizations, caucuses, conventions, or election campaigns.” Arthur and his subordinates, Naval Officer Alonzo B. Cornell and Surveyor George H. Sharpe, refused to obey the president’s order; Sherman encouraged Arthur to resign, offering him appointment by Hayes to the consulship in Paris in exchange, but Arthur refused. In September 1877, Hayes demanded the three men’s resignations, which they refused to give. Hayes then submitted the appointment of Theodore Roosevelt, Sr., L. Bradford Prince, and Edwin Merritt (all supporters of Conkling’s rival William M. Evarts) to the Senate for confirmation as their replacements. The Senate’s Commerce Committee, chaired by Conkling, unanimously rejected all the nominees; the full Senate rejected Roosevelt and Prince by a vote of 3125, and confirmed Merritt only because Sharpe’s term had expired. Arthur’s job was only spared until July 1878, when Hayes took advantage of a Congressional recess to fire him and Cornell, replacing them with the recess appointment of Merritt and Silas W. Burt. Hayes again offered Arthur the position of consul general in Paris as a face-saving consolation; Arthur again declined, as Hayes knew he probably would. Conkling opposed the confirmation of Merritt and Burt when the Senate reconvened in February 1879, but Merritt was approved by a vote of 3125, as was Burt by 3119, giving Hayes his most significant civil service reform victory. Arthur immediately took advantage of the resulting free time to work for the election of Edward Cooper as New York City’s next mayor. In September 1879 Arthur became Chairman of the New York State Republican Executive Committee, a post in which he served until October 1881. In the state elections of 1879, he and Conkling worked to ensure that the Republican nominees for state offices would be men of Conkling’s faction, who had become known as Stalwarts. They were successful, but narrowly, as Cornell was nominated for governor by a vote of 234216. Arthur and Conkling campaigned vigorously for the Stalwart ticket and, owing partly to a splintering of the Democratic vote, were victorious. Arthur and the machine had rebuked Hayes and their intra-party rivals, but Arthur had only a few days to enjoy his triumph when, on January 12, 1880, his wife died suddenly while he was in Albany organizing the political agenda for the coming year. Arthur felt devastated, and perhaps guilty, and never remarried. Garfield and his supporters knew they would face a difficult election without the support of the New York Stalwarts and decided to offer one of them the vice presidential nomination.Levi P. Morton, the first choice of Garfield’s supporters, consulted with Conkling, who advised him to decline, which he did. They next approached Arthur, and Conkling advised him to also reject the nomination, believing the Republicans would lose. Arthur thought otherwise and accepted. 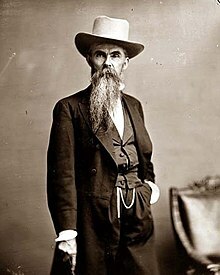 According to a purported eyewitness account by journalist William C. Hudson, Conkling and Arthur argued, with Arthur telling Conkling, “The office of the Vice-President is a greater honor than I ever dreamed of attaining.” Conkling eventually relented, and campaigned for the ticket. As expected, the election was close. The Democratic nominee, General Winfield Scott Hancock, was popular and, having avoided taking definitive positions on most issues of the day, he had not offended any pivotal constituencies. As Republicans had done since the end of the Civil War, Garfield and Arthur initially focused their campaign on the “bloody shirt“the idea that returning Democrats to office would undo the victory of the Civil War and reward secessionists. With the war fifteen years in the past and Union generals at the head of both tickets, the tactic was less effective than the Republicans hoped. Realizing this, they adjusted their approach to claim that Democrats would lower the country’s protective tariff, which would allow cheaper manufactured goods to be imported from Europe, and thereby put thousands out of work. This argument struck home in the swing states of New York and Indiana, where many were employed in manufacturing. Hancock did not help his own cause when, in an attempt to remain neutral on the tariff, he said that “he tariff question is a local question,” which only made him appear uninformed about an important issue. Candidates for high office did not personally campaign in those days, but as state Republican chairman, Arthur played a part in the campaign in his usual fashion: overseeing the effort in New York and raising money. The funds were crucial in the close election, and winning his home state of New York was critical. The Republicans carried New York by 20,000 votes and, in an election with the largest turnout of qualified voters ever recorded78.4%they won the nationwide popular vote by just 7,018 votes. The electoral college result was more decisive214 to 155and Garfield and Arthur were elected. After the election, Arthur worked in vain to persuade Garfield to fill certain positions with his fellow New York Stalwartsespecially that of the Secretary of the Treasury; the Stalwart machine received a further rebuke when Garfield appointed Blaine, Conkling’s arch-enemy, as Secretary of State. The running mates, never close, detached as Garfield continued to freeze out the Stalwarts from his patronage. Arthur’s status in the administration diminished when, a month before inauguration day, he gave a speech before reporters suggesting the election in Indiana, a swing state, had been won by Republicans through illegal machinations. Garfield ultimately appointed a Stalwart, Thomas Lemuel James, to be Postmaster General, but the cabinet fight and Arthur’s ill-considered speech left the President and Vice President clearly estranged when they took office on March 4, 1881. The Senate in the 47th United States Congress was divided among 37 Republicans, 37 Democrats, one independent (David Davis) who caucused with the Democrats, one Readjuster (William Mahone), and four vacancies. Immediately, the Democrats attempted to organize the Senate, knowing that the vacancies would soon be filled by Republicans. As vice president, Arthur cast tie-breaking votes in favor of the Republicans when Mahone opted to join their caucus. Even so, the Senate remained deadlocked for two months over Garfield’s nominations because of Conkling’s opposition to some of them. Just before going into recess in May 1881, the situation became more complicated when Conkling and the other Senator from New York, Thomas C. Platt, resigned in protest of Garfield’s continuing opposition to their faction. With the Senate in recess, Arthur had no duties in Washington and returned to New York City. Once there, he traveled with Conkling to Albany, where the former Senator hoped for a quick re-election to the Senate, and with it, a defeat for the Garfield administration. The Republican majority in the state legislature was divided on the question, to Conkling and Platt’s surprise, and an intense campaign in the state house ensued. While in Albany on July 2, Arthur learned that Garfield had been shot. The assassin, Charles J. Guiteau, was a deranged office-seeker who believed that Garfield’s successor would appoint him to a patronage job. He proclaimed to onlookers: “I am a Stalwart, and Arthur will be President!” Guiteau was found to be mentally unstable, and despite his claims to be a Stalwart supporter of Arthur, they had only a tenuous connection that dated from the 1880 campaign. More troubling was the lack of legal guidance on presidential succession: as Garfield lingered near death, no one was sure who, if anyone, could exercise presidential authority. Also, after Conkling’s resignation, the Senate had adjourned without electing a president pro tempore, who would normally follow Arthur in the succession. Arthur was reluctant to be seen acting as president while Garfield lived, and for the next two months there was a void of authority in the executive office, with Garfield too weak to carry out his duties, and Arthur reluctant to assume them. Through the summer, Arthur refused to travel to Washington and was at his Lexington Avenue home when, on the night of September 19, he learned that Garfield had died. Judge John R. Brady of the New York Supreme Court administered the oath of office in Arthur’s home at 2:15 a.m. on September 20. Later that day he took a train to Long Branch to pay his respects to Garfield and to leave a card of sympathy for his wife, afterwards returning to New York City. On the 21st, he returned to Long Branch to take part in Garfield’s funeral, and then joined the funeral train to Washington. Before leaving New York, he ensured the presidential line of succession by preparing and mailing to the White House a proclamation calling for a Senate special session. This step ensured that the Senate had legal authority to convene immediately and choose a Senate president pro tempore, who would be able to assume the presidency if Arthur died. Once in Washington he destroyed the mailed proclamation and issued a formal call for a special session. 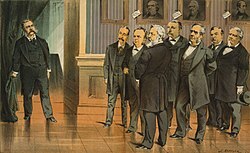 In an 1881 Puck cartoon, Arthur faces the cabinet after President Garfield was shot. Arthur arrived in Washington, D.C. on September 21. On September 22 he re-took the oath of office, this time before Chief Justice Morrison R. Waite. Arthur took this step to ensure procedural compliance; there had been a lingering question about whether a state court judge (Brady) could administer a federal oath of office. He initially took up residence at the home of Senator John P. Jones, while White House remodeling he ordered was carried out, including the addition of an elaborate fifty-foot glass screen made by Louis Comfort Tiffany, which remained in a White House corridor until it was dismantled in 1902. Arthur’s sister, Mary Arthur McElroy, served as White House hostess for her widowed brother; Arthur became Washington’s most eligible bachelor and his social life became the subject of rumors, though romantically, he remained singularly devoted to the memory of his late wife. His son, Chester Jr., was then a freshman at Princeton University and his daughter, Nell, stayed in New York with a governess until 1882; when she arrived, Arthur shielded her from the intrusive press as much as he could. Arthur quickly came into conflict with Garfield’s cabinet, most of whom represented his opposition within the party. He asked the cabinet members to remain until December, when Congress would reconvene, but Treasury Secretary William Windom submitted his resignation in October to enter a Senate race in his home state of Minnesota. Arthur then selected Charles J. Folger, his friend and fellow New York Stalwart as Windom’s replacement. Attorney General Wayne MacVeagh was next to resign, believing that, as a reformer, he had no place in an Arthur cabinet. Despite Arthur’s personal appeal to remain, MacVeagh resigned in December 1881 and Arthur replaced him with Benjamin H. Brewster, a Philadelphia lawyer and machine politician reputed to have reformist leanings. Blaine, nemesis of the Stalwart faction, remained Secretary of State until Congress reconvened, then departed immediately. Conkling expected Arthur to appoint him in Blaine’s place, but the President chose Frederick T. Frelinghuysen of New Jersey, a Stalwart recommended by ex-President Grant. Frelinghuysen advised Arthur not to fill any future vacancies with Stalwarts, but when Postmaster General James resigned in January 1882, Arthur selected Timothy O. Howe, a Wisconsin Stalwart. Navy Secretary William H. Hunt was next to resign, in April 1882, and Arthur attempted a more balanced approach by appointing Half-Breed William E. Chandler to the post, on Blaine’s recommendation. Finally, when Interior Secretary Samuel J. Kirkwood resigned that same month, Arthur appointed Henry M. Teller, a Colorado Stalwart to the office. Of the Cabinet members Arthur had inherited from Garfield, only Secretary of War Robert Todd Lincoln remained for the entirety of Arthur’s term. In the 1870s, a scandal was exposed, in which contractors for star postal routes were greatly overpaid for their services with the connivance of government officials (including Second Assistant Postal Secretary Thomas J. Brady and former Senator Stephen Wallace Dorsey). Reformers feared Arthur, as a former supporter of the spoils system, would not commit to continuing the investigation into the scandal. But Arthur’s Attorney General, Brewster, did in fact continue the investigations begun by MacVeigh, and hired notable Democratic lawyers William W. Ker and Richard T. Merrick to strengthen the prosecution team and forestall the skeptics. Although Arthur had worked closely with Dorsey before his presidency, once in office he supported the investigation and forced the resignation of officials suspected in the scandal. An 1882 trial of the ringleaders resulted in convictions for two minor conspirators and a hung jury for the rest. After a juror came forward with allegations that the defendants attempted to bribe him, the judge set aside the guilty verdicts and granted a new trial. Before the second trial began, Arthur removed five federal office holders who were sympathetic with the defense, including a former Senator. The second trial began in December 1882 and lasted until July 1883 and, again, did not result in a guilty verdict. Failure to obtain a conviction tarnished the administration’s image, but Arthur did succeed in putting a stop to the fraud. Garfield’s assassination by a deranged office seeker amplified the public demand for civil service reform. Both Democratic and Republican leaders realized that they could attract the votes of reformers by turning against the spoils system and, by 1882, a bipartisan effort began in favor of reform. In 1880, Democratic Senator George H. Pendleton of Ohio introduced legislation that required selection of civil servants based on merit as determined by an examination. In his first annual presidential address to Congress in 1881, Arthur requested civil service reform legislation and Pendleton again introduced his bill, but Congress did not pass it. Republicans lost seats in the 1882 congressional elections, in which Democrats campaigned on the reform issue. As a result, the lame-duck session of Congress was more amenable to civil service reform; the Senate approved Pendleton’s bill 385 and the House soon concurred by a vote of 15547. 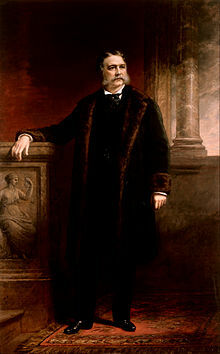 Arthur signed the Pendleton Civil Service Reform Act into law on January 16, 1883. In just two years’ time, an unrepentant Stalwart had become the president who ushered in long-awaited civil service reform. With high revenue held over from wartime taxes, the federal government had collected more than it spent since 1866; by 1882 the surplus reached $145 million. Opinions varied on how to balance the budget; the Democrats wished to lower tariffs, in order to reduce revenues and the cost of imported goods, while Republicans believed that high tariffs ensured high wages in manufacturing and mining. They preferred the government spend more on internal improvements and reduce excise taxes. Arthur agreed with his party, and in 1882 called for the abolition of excise taxes on everything except liquor, as well as a simplification of the complex tariff structure. In May of that year, Representative William D. Kelley of Pennsylvania introduced a bill to establish a tariff commission; the bill passed and Arthur signed it into law but appointed mostly protectionists to the committee. Republicans were pleased with the committee’s make-up but were surprised when, in December 1882, they submitted a report to Congress calling for tariff cuts averaging between 20 and 25%. The commission’s recommendations were ignored, however, as the House Ways and Means Committee, dominated by protectionists, provided a 10% reduction. After conference with the Senate, the bill that emerged only reduced tariffs by an average of 1.47%. The bill passed both houses narrowly on March 3, 1883, the last full day of the 47th Congress; Arthur signed the measure into law, with no effect on the surplus. Congress attempted to balance the budget from the other side of the ledger, with increased spending on the 1882 Rivers and Harbors Act in the unprecedented amount of $19 million. While Arthur was not opposed to internal improvements, the scale of the bill disturbed him, as did its narrow focus on “particular localities,” rather than projects that benefited a larger part of the nation. On August 1, 1882, Arthur vetoed the bill to widespread popular acclaim; in his veto message, his principal objection was that it appropriated funds for purposes “not for the common defense or general welfare, and which do not promote commerce among the States.” Congress overrode his veto the next day and the new law reduced the surplus by $19 million. Republicans considered the law a success at the time, but later concluded that it contributed to their loss of seats in the elections of 1882. During the Garfield administration, Secretary of State James G. Blaine attempted to invigorate United States diplomacy in Latin America, urging reciprocal trade agreements and offering to mediate disputes among the Latin American nations. Blaine, venturing a greater involvement in affairs south of the Rio Grande, proposed a Pan-American conference in 1882 to discuss trade and an end to the War of the Pacific being fought by Bolivia, Chile, and Peru. Blaine did not remain in office long enough to see the effort through, and when Frederick T. Frelinghuysen replaced him at the end of 1881, the conference efforts lapsed. Frelinghuysen also discontinued Blaine’s peace efforts in the War of the Pacific, fearing that the United States might be drawn into the conflict. Arthur and Frelinghuysen continued Blaine’s efforts to encourage trade among the nations of the Western Hemisphere; a treaty with Mexico providing for reciprocal tariff reductions was signed in 1882 and approved by the Senate in 1884. Legislation required to bring the treaty into force failed in the House, however, rendering it a dead letter. Similar efforts at reciprocal trade treaties with Santo Domingo and Spain’s American colonies were defeated by February 1885, and an existing reciprocity treaty with the Kingdom of Hawaii was allowed to lapse. A more contentious debate materialized over the status of Chinese immigrants; in January 1868, the Senate had ratified the Burlingame Treaty with China, allowing an unrestricted flow of Chinese into the country. As the economy soured after the Panic of 1873, Chinese immigrants were blamed for depressing workmen’s wages; in reaction Congress in 1879 attempted to abrogate the 1868 treaty by passing the Chinese Exclusion Act, but President Hayes vetoed it. 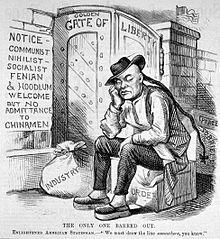 Three years later, after China had agreed to treaty revisions, Congress tried again to exclude Chinese immigrants; Senator John F. Miller of California introduced another Chinese Exclusion Act that denied Chinese immigrants United States citizenship and banned their immigration for a twenty-year period. The bill passed the Senate and House by overwhelming margins, but this as well was vetoed by Arthur, who concluded the 20-year ban to be a breach of the renegotiated treaty of 1880. That treaty allowed only a “reasonable” suspension of immigration. Eastern newspapers praised the veto, while it was condemned in the Western states. Congress was unable to override the veto, but passed a new bill reducing the immigration ban to ten years. Although he still objected to this denial of citizenship to Chinese immigrants, Arthur acceded to the compromise measure, signing the Chinese Exclusion Act into law on May 6, 1882. In the years following the Civil War, American naval power declined precipitously, shrinking from nearly 700 vessels to just 52, most of which were obsolete. The nation’s military focus over the fifteen years before Garfield and Arthur’s election had been on the Indian wars in the West, rather than the high seas, but as the region was increasingly pacified, many in Congress grew concerned at the poor state of the Navy. Garfield’s Secretary of the Navy, William H. Hunt, advocated reform of the Navy and his successor, William E. Chandler, appointed an advisory board to prepare a report on modernization. Based on the suggestions in the report, Congress appropriated funds for the construction of three steel protected cruisers (Atlanta, Boston, and Chicago) and an armed dispatch-steamer (Dolphin), collectively known as the ABCD Ships or the Squadron of Evolution. Congress also approved funds to rebuild four monitors (Puritan, Amphitrite, Monadnock, and Terror), which had lain uncompleted since 1877. The contracts to build the ABCD ships were all awarded to the low bidder, John Roach & Sons of Chester, Pennsylvania, even though Roach once employed Secretary Chandler as a lobbyist. Democrats turned against the “New Navy” projects and, when they won control of the 48th Congress, refused to appropriate funds for seven more steel warships. 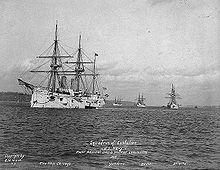 Even without the additional ships, the state of the Navy improved when, after several construction delays, the last of the new ships entered service in 1889. Like his Republican predecessors, Arthur struggled with the question of how his party was to challenge the Democrats in the South and how, if at all, to protect the civil rights of black southerners. Since the end of Reconstruction, conservative white Democrats (or “Bourbon Democrats“) had regained power in the South, and the Republican party dwindled rapidly as their primary supporters in the region, blacks, were disenfranchised. One crack in the solidly Democratic South emerged with the growth of a new party, the Readjusters, in Virginia. Having won an election in that state on a platform of more education funding (for black and white schools alike) and abolition of the poll tax and the whipping post, many northern Republicans saw the Readjusters as a more viable ally in the South than the moribund southern Republican party. Arthur agreed, and directed the federal patronage in Virginia through the Readjusters rather than the Republicans. He followed the same pattern in other Southern states, forging coalitions with independents and Greenback Party members. Some black Republicans felt betrayed by the pragmatic gambit, but others (including Frederick Douglass and ex-Senator Blanche K. Bruce) endorsed the administration’s actions, as the Southern independents had more liberal racial policies than the Democrats. Arthur’s coalition policy was only successful in Virginia, however, and by 1885 the Readjuster movement began to collapse with the election of a Democratic president. Other federal action on behalf of blacks was equally ineffective: when the Supreme Court struck down the Civil Rights Act of 1875 in the Civil Rights Cases (1883), Arthur expressed his disagreement with the decision in a message to Congress, but was unable to persuade Congress to pass any new legislation in its place. Arthur did, however, effectively intervene to overturn a court-martial ruling against a black West Point cadet, Johnson Whittaker, after the Judge Advocate General of the Army, David G. Swaim, found the prosecution’s case against Whittaker to be illegal and based on racial bias. The administration faced a different challenge in the West, where the LDS Church was under government pressure to stop the practice of polygamy in Utah Territory. Garfield had believed polygamy was criminal behavior and was morally detrimental to family values, and Arthur’s views were, for once, in line with his predecessor’s. In 1882, he signed the Edmunds Act into law; the legislation made polygamy a federal crime, barring polygamists both from public office and the right to vote. The Arthur administration was challenged by changing relations with western Native American tribes. The American Indian Wars were winding down, and public sentiment was shifting toward more favorable treatment of Native Americans. Arthur urged Congress to increase funding for Native American education, which it did in 1884, although not to the extent he wished. He also favored a move to the allotment system, under which individual Native Americans, rather than tribes, would own land. Arthur was unable to convince Congress to adopt the idea during his administration but, in 1887, the Dawes Act changed the law to favor such a system. The allotment system was favored by liberal reformers at the time, but eventually proved detrimental to Native Americans as most of their land was resold at low prices to white speculators. During Arthur’s presidency, settlers and cattle ranchers continued to encroach on Native American territory. Arthur initially resisted their efforts, but after Secretary of the Interior Henry M. Teller, an opponent of allotment, assured him that the lands were not protected, Arthur opened up the Crow Creek Reservation in the Dakota Territory to settlers by executive order in 1885. Arthur’s successor, Grover Cleveland, finding that title belonged to the Native Americans, revoked Arthur’s order a few months later. Shortly after becoming president, Arthur was diagnosed with Bright’s disease, a kidney ailment now referred to as nephritis. He attempted to keep his condition private, but by 1883 rumors of his illness began to circulate; he had become thinner and more aged in appearance, and struggled to keep the pace of the presidency. To rejuvenate his health outside the confines of Washington, Arthur and some political friends traveled to Florida in April 1883. The vacation had the opposite effect, and Arthur suffered from intense pain before returning to Washington. Later that year, on the advice of Missouri Senator George Graham Vest, he visited Yellowstone National Park. Reporters accompanied the presidential party, helping to publicize the new National Park system. The Yellowstone trip was more beneficial to Arthur’s health than his Florida excursion, and he returned to Washington refreshed after two months of travel. Arthur made appointments to fill two vacancies on the United States Supreme Court. The first vacancy arose in July 1881 with the death of Associate Justice Nathan Clifford, a Democrat who had been a member of the Court since before the Civil War. Arthur nominated Horace Gray, a distinguished jurist from the Massachusetts Supreme Judicial Court to replace him, and the nomination was easily confirmed. The second vacancy occurred when Associate Justice Ward Hunt retired in January 1882. 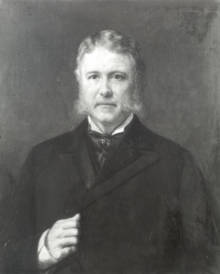 Arthur first nominated his old political boss, Roscoe Conkling; he doubted that Conkling would accept, but felt obligated to offer a high office to his former patron. The Senate confirmed the nomination but, as expected, Conkling declined it, the last time a confirmed nominee declined an appointment. Senator George Edmunds was Arthur’s next choice, but he declined to be considered. Instead, Arthur nominated Samuel Blatchford, who had been a judge on the Second Circuit Court of Appeals for the prior four years. Blatchford accepted, and his nomination was approved by the Senate within two weeks. Blatchford served on the Court until his death in 1893. After spending the summer of 1886 in New London, Connecticut, he returned home, and became seriously ill and, on November 16, ordered nearly all of his papers, both personal and official, burned. The next morning, Arthur suffered a cerebral hemorrhage and never regained consciousness; he died the following day, November 18, at the age of 57. On November 22, a private funeral was held at the Church of the Heavenly Rest in New York City, attended by President Cleveland and ex-President Hayes, among other notables. Arthur was buried with his family members and ancestors in the Albany Rural Cemetery in Menands, New York. He was laid beside his wife in a sarcophagus on a large corner of the plot. In 1889, a monument was placed on Arthur’s burial plot by sculptor Ephraim Keyser of New York, consisting of a giant bronze female angel figure placing a bronze palm leaf on a granite sarcophagus. In 1898, the Arthur memorial statuea fifteen-foot (4.6 m), bronze figure of Arthur standing on a Barre Granite pedestalwas created by sculptor George Edwin Bissell and installed at Madison Square, in New York City. The statue was dedicated in 1899 and unveiled by Arthur’s sister, Mary Arthur McElroy. At the dedication, Secretary of War Elihu Root described Arthur as, “…wise in statesmanship and firm and effective in administration,” while acknowledging that Arthur was isolated in office and unloved by his own party.